I totally believed that our government would follow all its own laws. At the same time I could not understand what IRS was doing to me. In order to find something that would help I went to the library and after extensive reading I found the Universal Declaration of Human Rights. I thought, for sure, that would help. 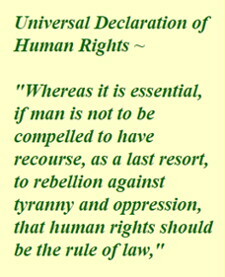 I mention the Universal Declaration of Human Rights in the following letter. I just finished writing to Mr. Castillo, a copy of which letter is enclosed. When I finished the letter, I was freezing cold. I believe this was a result of thinking that if I told him how really hopeless I think this problem is, for the reasons that I think it’s hopeless, that he would see what I meant and not be able to do anything. I thought that if he wasn’t aware of some aspects of this problem, he might go ahead, believing there was hope, and do something that changed what I see as the inevitable outcome. Thus, the following paragraphs from that letter no longer appear in it, having been transferred here. I cannot simply delete them, since they are ultimately extremely important and are the basis of my belief that the only way this problem can be avoided in the future is to institute a National Sales Tax with quarterly rebates to low income families. Well, it was a third of that letter, from the bottom of page two through the end, and the idea already permeated the first two thirds of the letter. So I couldn’t really take it out, because it’s what the problem is. I suppose the thing to do is to send him a copy of this letter, so that he realizes that I thought he might be able to do something. And then there’s the additional problem that Mr. Andreas and Mr. Lintner may be friends of yours. I doubt, for some reason that you know Mr. Gallo, perhaps because I don’t think of you living in California. If they are friends of yours, you may favor tax programs that give more breathing room to those that already have the most. Last November and early December I sent out lots of copies of the cover and/or the first page of Forbes’ story The New Refugees. Lots of people responded that it had nothing to do with people in lower income levels. I however felt it had everything to do with me, since having lived out of the country that was not an option I wanted to take. Like Socrates, I feel, and have felt for a long time, that death is preferable to exile. Not because I would miss this government, but because I already know how much I missed talking to Americans. After nine years in London, I was still an American and different. Here, even two men in dark suits, visiting me from the Treasury Department, have more in common with me than most if not all English people have. That commonality is deeply important to me, as I believe it is important to many people. Perhaps if Steve Forbes is elected, the tax refugees will be able to return, with presidential amnesty. My feeling is that Forbes went the Flat Tax route because the idea of a National Sales Tax has become synonymous with “regressive.” Perhaps he thought, or was advised, that no one would hear what he was proposing, if he was proposing a National Sales Tax, because everyone would be so eager to correct him. From talking to Frank Davis at Citizens for an Alternative Tax System, which organization I disagree with on the issue of refunds to low income families — I believe these are essential, CATS appears to believe they are not acceptable — I understand that the thought on the time line for all of this is: presidential elections in 1996, tax legislation in 1997. I will say that while I do not intend to vote for Mr. Forbes, I am very grateful for the message he is disseminating, I think he is doing us all a great service. Rather than thanking you, Mr. Skadden, I would like to say what an impact you’ve had on my thinking. I keep writing letters and sending them out, knowing that mail order catalog people believe a 5% return to be excellent, knowing that when I did direct mailings as a Realtor and got a 10% return it gave me a nice living, even if that income was not “regular” on a weekly or monthly basis, but in this, with no replies most of the time, and the time of the foreclosure drawing nearer, most days it’s hard for me to reply to people who tell me that none of my letters will make any difference. The thing is, if I can’t get any of my legislators to pay attention to this problem, and if none of my letters make any difference, then people are right to take extreme actions as per the beginning of the Universal Declaration of Human Rights. I’ll enclose a copy of my letter to Don Boroughs. And, I don’t want to believe that things are really that bad. I think it is better for me, and for my country people, for me to kill myself than for me to believe things are that bad and join with people who are arming themselves and planting bombs. Your response to my letter encourages me. Unless of course, you only wanted to know if I am armed, as per the indication of Mr. Roybal’s question. I am not including my 911 form, but I sent it with items 12 and 13 above. My computer shows that I actually wrote item 12 above on 10/26/94, and this would seem to be true from the content of this letter.